Trinity Lutheran Church in North Branch is seeking a Director of Youth and Family Ministries at 25 hours a week. This position’s primary responsibility is to create, manage and direct all aspects of youth and children’s ministry. The person serving in this position guides young people in their faith journey and imparts the teachings of their faith through prayer, events, activities and mission trips and encourages them to be faithful followers of Jesus. This position also shapes the worship life of the children in the congregation and empowers others to share in this ministry.For more information view the Director of Youth and Family Ministries Position Description. 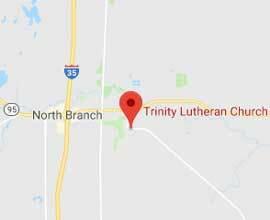 Trinity Lutheran Church in North Branch is seeking a part time, seasonal (May to Oct) employee for Cemetery Maintenance. This position’s primary responsibility is for maintaining the overall grounds and look of the cemetery which includes general mowing, trimming, and upkeep of grave sites. For more information view the Cemetery Maintenance position description.